Over the last two weeks New Zealand has reflected on the 15 March mosque shootings, and I would like to acknowledge that our hearts go out to the families of those who lost their lives in that evil carnage. I would like to praise the first responders, including the New Zealand Police, St John Ambulance Service and the hospital staff who had to deal with this atrocity. In other news, KPMG has undertaken their 2019 Agribusiness Agenda Roundtable Sessions, and one of the key messages from KPMG Global Head of Agribusiness Ian Proudfoot is that internationally, the BioTech sector is strong and the world understands the value biotechnology contributes to solutions to our global issues. The Market Insights Report that BIOTechNZ is undertaking is an opportunity for us to raise the profile of the BioTech sector here in New Zealand. This is key to ensuring that our sector is able to identify opportunities and barriers to growth, as well as being able to support Government decision making in order to enable policy development. We are seeking collaborative project partners from the industry to work with BIOTechNZ, NZTech, MBIE and Callaghan Innovation to provide active input and perspective during the project. If your company is interested in supporting this key document for the BioTech sector, please contact me. On Wednesday 27 March I attended the Natural Health Products NZ Summit 2019 which was focused on ‘The Challenge of Change.’ It was great to see so many companies present, highlighting our strong natural health sector. 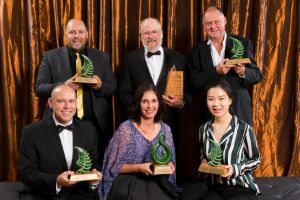 Congratulations to the winners of the industry awards, especially BIOTechNZ member Chris Johnson and his team at Anagenix. In other BIOTechNZ member news, I want to give a shout out to Mint Innovation who has been named as one of the NZ Hi-Tech Awards Finalists in the Hi-Tech Start-up Company of the Year category. Congratulations are also in order for Blis Technologies who has lifted its forecasted full year result on the back of strong offshore orders. Whoop Whoop! I hope to catch up with a large number of the BioTech community at our Tech Alliance Event Series ‘Can connected capital support the scale up of New Zealand’s primary and technology sectors?’ on 9 April in Christchurch, 10 April in Wellington and 11 April in Auckland. Can connected capital support the scale up of New Zealand’s primary sector? The first of the New Zealand Techweek19 events have been announced and there are some great BioTech events, including Lasers, Sperm, and other Great Ideas, and Medtech – Good for the world? There’s still time to get your event submission in, but be quick, submissions close 8 April. Apply now for the Falling Walls Lab New Zealand. This is an opportunity for the next generation of innovators to share, in three minutes, their research project, business model or social initiative relevant to the world today and compete to win a trip to the Falling Walls lab Finale in Berlin. Congratulations to the finalists for the 2019 NZ Hi-Tech Awards. Secure your tickets for the Gala Dinner on 24 May in Auckland. Register now for Crazy & Ambitious 2, a BioHeritage symposium on 20-21 May at Te Papa in Wellington. Listen to No8 Ventures founder Jenny Morel talk about her 20 years in the tech industry on The Spinoff’s Business is Boring podcast. A BioTech school has been launched to teach jobseekers the key skills they need to work in the field. Learn how BIOTechNZ member Mint Innovation is making e-waste less wasteful. New analysis shows a 65 percent boom in BioTech since 2016. Considering expansion in Asia? Check out details of the Future Foods Asia 2019 conference on 3-4 June in Singapore. Early bird rates for BIO 2019 in Philadelphia end 12 April, so get your tickets now. Agritech New Zealand’s Peter Wren-Hilton explains why substantial growth is expected in the local sector this year. BIOTechNZ is a membership funded organisation, so if you are not already a member, please consider joining us. Previous Previous post: Whatever happened to the plan to make Aotearoa a green tech giant?